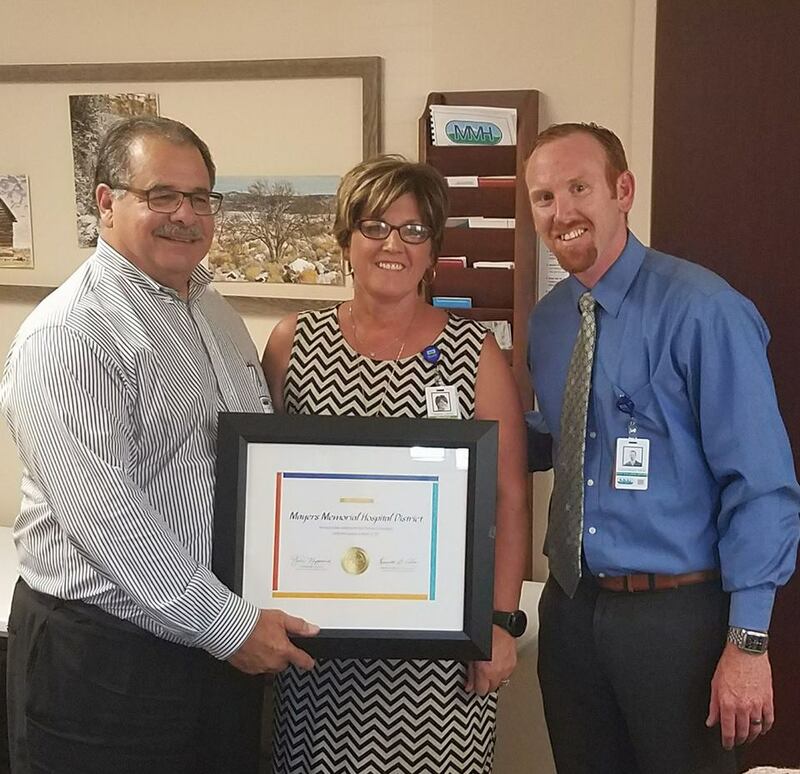 Mayers Memorial Hospital District (MMHD) has met all of the criteria to be one of only 17 healthcare district’s in the state to be a Certified Healthcare District. The Association of California Healthcare Districts (ACHD) Chief Executive Officer Ken Cohen presented MMHD with their certificate at the July 26 MMHD Board meeting. Association of California Healthcare District CEO Ken Cohen, Valery Lakey and Louis Ward at the July 26th MMHD Board meeting. California Healthcare Districts respond to the specialized health needs of California communities. Voters have created 79 Healthcare Districts to fill distinct gaps in local health care services – from wellness and prevention to emergency rooms and long-term care. 54 of these Districts serve the state’s rural areas. Mayers Memorial Hospital District became a district in 1969. As Public Entities, Healthcare Districts have well defined obligations for conducting business in a manner that is open and transparent. To assist members in demonstrating compliance with these obligations, the Governance Committee of the Association of California Healthcare Districts (ACHD) has developed a core set of standards referred to as Best Practices in Governance. Healthcare Districts that demonstrate compliance with these practices receive the designation of ACHD Certified Healthcare District. Earning the designation of a Certified Healthcare District by ACHD is an honor and a proactive step in maintaining the confidence of the people we serve. The certification assures our community that we are committed to the responsibilities we have as a District. We will always work with the best interest of the residents of the Intermountain area in mind; to provide essential quality care and access to health care in our rural setting.